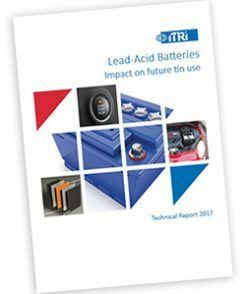 This ITRI report has reviewed use of tin in lead-acid batteries, concluding that current estimated 2016 use of 28,100 tpa may grow at around 2.5% to 36,000 tpa by 2025, after which there is a high risk of substitution by lithium-ion and other technologies. Loss of an important current market in e-bikes in China will be compensated by moves towards high performance tin-containing products for new hybrid vehicles. Substitution will only impact by around 10% to 2025 but may then become significant, especially if the EU bans lead-acid battery use in electric vehicles.